PRESIDENT OF BOSTON UNIVERSITY, CORPORATE MEMBER OF THE AMERICAN ORIENTAL SOCIETY. AUTHOR OF " ANFANGSGRUNDE DER LOGIK," " EINLEITUNG INDIE SYSTHMATISCHE THEOLOGIE," "THE TRUE KEY TO ANCIENTCOSMOLOGY AND MYTHICAL GEOGRAPHY.' ETC., ETC. WITH ORIGINAL ILLUSTRATIONS DIAGRAM ILLUSTRATING THE TRUE KEY TO ANCIENT COSMOLOGY AND MYTHICAL GEOGRAPHY. Compare p. 479. The Northern celestial Pole in the zenith. The axis of the heavens in perpendicular position. The axis of the Earth in perpendicular position. The abode of the supreme God, or gods. Earth - surrounding equatorial Ocean - river. The abode of disembodied human souls. The Strength of the Hill of Sion." THIS book is not the work of a dreamer. Neither has it proceeded from a love of learned paradox. Nor yet is it a cunningly devised fable aimed at particular tendencies in current science, philosophy, or religion. It is a thoroughly serious and sincere attempt to present what is to the author's mind the true and final solution of one of the greatest and most fascinating of all problems connected with the history of mankind. That this true solution has not been furnished before is not strange. The suggestion that primitive Eden was at the Arctic Pole seems at first sight the most incredible of all wild and willful paradoxes. And it is only within the lifetime of our own generation that the progress of geological discovery has relieved the hypothesis of fatal antecedent improbability. Moreover, when one considers the enormous variety and breadth of the fields from which its evidences of truth must be derived; when one remembers how recent are those comparative sciences on whose results the argument must chiefly depend; when one observes that many of the most striking of our alleged proofs, both in the physical and in the anthropological domain, are precisely the latest of the conclusions of these most modern of all sciences, it is easy to see that a generation ago the demonstration here attempted could not have been given. Even five years ago some of the most interesting and cogent of our arguments would as yet have been lacking. The interest which has so long invested our problem, and which has prompted so many attempts to solve it, was never greater than today. The lapse of centuries has rendered many another question antiquated, but not this. On the contrary, the more the modern world has advanced in new knowledge, the more exigent has grown the necessity of finding a valid solution. Men are feeling as never before that until the starting-point of human history can be determined, the historian, the archaeologist, and the paleontological anthropologist are all working in the dark. It is seen that without this desideratum the ethnologist, the philologist, the mythographer, the theologian, the sociologist can none of them construct anything not liable to profound modification, if not to utter overthrow, the moment any new light shall be thrown upon the mother-region and the prehistoric movements of the human race. 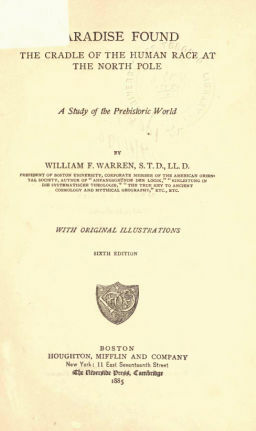 Every anthropological science, therefore, and every science related to anthropology, seems at the present moment to be standing in a state of dubitant expectancy, willing to work a little tentatively, but conscious of its destitution of the needful primal datum, and conscious of its consequent lack of a valid structural law. To the believer in Revelation, or even in the most ancient and venerable Ethnic Traditions, the volume here presented will be found to possess uncommon interest. For many years the public mind has been schooled in a narrow naturalism, which has in its world-view as little room for the extraordinary as it has for the supernatural. Decade after decade the representatives of this teaching have been measuring the natural phenomena of every age and of every place by the petty measuring rod of their own local and temporary experience. So long and so successfully have they dogmatized on the constancy of Nature's laws and the uniformity of Nature's forces that of late it has required no small degree of courage to enable an intelligent man to stand up in the face of his generation and avow his personal faith in the early existence of men of gigantic stature and of almost millenarian longevity. Especially have clergymen and Christian teachers and writers upon Biblical history been embarrassed by the popular incredulity on these subjects, and not infrequently by a consciousness that this incredulity was in some measure shared by themselves. To all such, and indeed to all the broader minded among the naturalists themselves, a new philosophy of primeval history a philosophy which for all the alleged extraordinary effects provides the adequate extraordinary causes cannot fail to prove most welcome. The execution of the plan of the book is by no means all that the author could desire. To the elaboration of so vast an argument, the materials for which must be gleaned from every possible field of knowledge, the broadest and profoundest scholar might well devote the undistracted labor of a lifetime. To the writer, loaded with the cares of a laborious executive office, there were lacking both the leisure and the equipment otherwise attainable for so high a task. The best he could do was to turn one or two summer vacations into work-time and give the result to the world. Of the correctness of his position he has no doubt, and of the preparedness of the scientific world to accept it he is also confident. To the foregoing remarks it may be proper to add that apart from its immediate purpose the book has interest, and, it is hoped, value as a contribution to the infant science of Comparative Mythology. By the application of the author's " True Key to Ancient Cosmology and Mythical Geography," it has been possible to adjust and interpret a great variety of ancient cosmological and geographical notions never before understood by modern scholars. For example, the origin and significance of the Chinvat Bridge are here for the first time explained. The indication of the polocentric character common to the mythical systems of sacred geography among all ancient peoples will probably be new to every reader. The new light thrown upon such questions as those relating to the direction of the Sacred Quarter, the location of the Abode of the Dead, the character and position of the Cosmical Tree, the course of the backward-flowing Ocean-river, the correlation of the " Navels " of Earth and Heaven, not to enumerate other points, can hardly fail to attract the lively attention of all students and teachers of ancient mythology and mythical geography. To teachers of Homer the fresh contributions toward a right understanding of Homeric cosmology are sure to prove of value. And if, in the end, the work may only lead to a systematic and intelligent teaching of the long neglected, but most important science of ancient cosmology and mythical geography in all reputable universities and classical schools, it will surely not have been written in vain. That the author has escaped all errors and oversights while ranging through so numerous and such diverse fields of investigation, many of which are but just opened to the pioneering specialist, is too much to expect. He only asks that any such blemishes which a more competent scholarship may detect, or which the progress of new learning may yet bring to light, may not be allowed to prejudice the force of true arguments, but may be pointed out in the spirit of a candid and helpful criticism. 1. The same, being interpreted, read as follows: " Once upon a time there was a king's son; nobody had so many and such beautiful books as he. In these all that had ever happened in the world he could read and see depicted in splendid engravings. Of every people and of every land could he get information, but as to where the Garden of Eden was, not a word was to be found therein; and this, just this it was, on which he meditated most of all." THE LOCATION OF EDEN: STATE OF THE QUESTION.